After VOX 253 Ladylike and Topas Plus had been introduced some customers asked for a more compact subwoofer module. Bernd Timmermanns used this opportunity to further develop the Topas Plus. 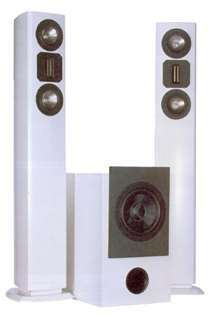 The new version is called Topas Signature Evo 07 and was combined with a Ladylike II subwoofer. The Topas Signature Evo 07 is a sealed cabinet floorstanding speaker equipped with a Visaton MHT 12 magnetostat and two Visaton TI 100 titanium cone bass drivers. The small subwoofer is equipped with a Visaton TIW 200 XS bass driver and Hypex module DS 4.0. "In our listening room the slim sat / sub team showed of an acoustic perfection we seldom experienced. Thanks to a switching unit we could listen to the old and new crossover in comparison. And this comparison was a revelation. The new crossover resulted in a sound reproduction that was completely detached from the loudspeakers. The Vox crossover was already quite good, but the Topas one was simply outstanding. It became apparent how advantageous the use of the three pull circuits is to linearise the frequency response. The sound was amazingly open and totally detached from the speakers. Quite clearly, the effort in developing a new crossover paid off. And by the way, the subwoofer fits in perfectly with the airy and wide staged sound, supporting the performance with abysmal and bone-dry bass. There is even a substantial amount of dynamics coming from this handsome subwoofer module. Not only considering size, this system shows a considerable power handling, leaving almost nothing to be desired." The MHT 12/RS is not available, since Jean Audio sells the MHT12/RS directly, not via dealers.